Have you noticed that the British garden bloggers seem to speak a different English language than the American garden bloggers? Many of the gardeners in England (it is okay to say England vs. Great Britain, isn’t it?) garden in allotments, which turn out to be community gardens divided up into individual gardens. And based on what I’ve read, there are waiting lists to get into some of these gardens. I think what would be nice about gardening in a community garden is that the people you run into there would be gardeners, too, and so you could have a nice chat about gardening and plants. When you garden in your own yard, you may or may not have neighbors who also like to garden, so there isn’t always a lot of discussion about gardening over the fence, if you even see your neighbors. I think the downside of gardening in an allotment garden is that you have to make it a point to go to the garden to do the gardening, which is somewhat like having to go to a gym to work out instead of having some exercise equipment at home. You really have to be motivated and want to do it, to make either work. Regarding the differences in our common English language, I don’t think they have ‘yards’ in England. They have gardens and lawns. And not too many people really have lawns there. And the vegetable garden? I’ve seen it referred to as a potager, which is a term I think they borrowed from the French. Daughter of the Soil, one of several British garden blogs I enjoy reading, recently had a post about burying a hedge hog in a tumulus. I’ll admit I had to look up “tumulus” to find out it is a mound of earth. They also don’t call summer squash, “zucchini”, they call it “courgette” and an ear of corn is a cob. And they don’t have pruners, they have secateurs. What does an American garden look like? I guess it depends on if you are gardening in Virginia, Florida, Washington, California, Arizona or Indiana. Even in California, they have about a hundred different climates, or claim to, so you would have a tough time identifying even a California Garden and conjuring up the same image in everyone’s minds. I do like my American garden and can’t imagine gardening any place else. Or it is more I don’t know if I could learn to garden any place else, having gardened here all of my life? The picture above is the one and only rose in my garden. I haven’t allowed myself to have a lot of roses because I don’t want to deal with all the diseases and pests that readily attack them around here. Plus, I know as hard as I try, as much as I do, or how much I wish for it to happen, my roses would never be quite the same as the roses pictured in English Gardens. 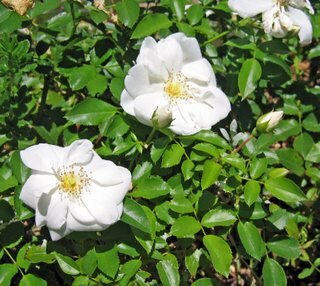 This particular rose is a “Flower Carpet” brand shrub rose. Doesn’t look too bad, really, for mid-August, does it?. Those leaves look so shiny and green and disease free. Maybe I should re-think this rose thing and get some more roses? I did get kind of interested in roses after watching the DVD “Secrets of the Rose Gardener”. Maybe if I had the right varieties? Maybe if every summer was like this one? Maybe? Hi Carol, im in England, in Yorkshire.I was aware of the language difference between here in the UK and USA.People do have gardens, which are generally either front or back. If I use the word yard its for American readers.That midsummers night dream quote is awesome. There is a list now (some waiting lists are years long, or have stopped adding names) for Allotments.There has been a movement to grow fresh organic fruit and veg.There was concern at chemicals used in the traditional fruit and veg, and GM crops too. The allotments are now being used by younger people and families.Traditionally it was an older man who grew veggies etc. I use the blog as my community garden as neither of my neighbours garden at all. The word Lawn to me means level flat grass, cut with a regular pattern.People here are obscessed with lawn care.My hillside garden has grass which i cut.Its so weedy and slopes that its not a lawn. Snappy, Thanks for the comment and additional information. I feel fortunate to have garden space in front AND in back. Separted by a common language eh! Luckily my allotment is a short distance(250yards or should I say metres!? )down a track from my house. Now I know that a zucchini is a courgette and a vegetable garden is a potager. I don’t know why I would read these things and not bother finding out what they meant? Thanks. Great post. My father was English so I learned the two languages and at times find someone who asks what I mean by a word I am using (hadn't realized it was "English"). Whenever I have visited England, I am enthralled by the allotments, they have so much history to them and I have learned and been inspired by many British gardens and gardeners. Your rose is gorgeous. I have one little red rose left and won't grow more for the reasons you have stated here--diseases and pests. Enjoyed reading this! I was fortunate to visit England this spring and it was lovely! Having moved around quite a bit, you can garden in all kinds of situations...you just have to adapt! We are fortunate, though, to garden as most of us do/can in the USA. Enjoyed reading this! I was able to visit England this spring and it was lovely! As someone who has moved around quite a bit, you can garden in different places...you just have to adapt! We are fortunate to be able to garden as most of us can/do here in the USA. Ha! Funnily enough I was just considering writing a post about the differences in garden terminology between Britain and the US. When I started my blog (thanks for the link!) I used lots of Britishisms without really thinking about it, but as I've had more and more American friends visiting it I've become quite self-conscious about the language differences! The biggest differences seem to be in relation to beans. What you call pole beans and bush beans we call climbing French beans and dwarf French beans. Fava beans are broad beans. Lima beans are butter beans. What you refer to as an English Garden is probably what we'd call a cottage garden. They're still very popular over here. And no, we don't have "yards". Just "front gardens" and "back gardens". Though if it's a very small space with mainly hard paving we might call it a "courtyard". And we pronounce tomato as "to-mah-to"! Because of Britain's strong historic links with France we use a lot of French-derived words in the garden (like "courgette" and "potager") which are rarely seen across the Atlantic. "Potager" usually means a mixed garden where veg is grown along with herbs and flowers. You've got it exactly right about allotments. It takes a lot of commitment to maintain a garden away from home but it's more than made up for by the wonderful sense of community and the sharing of knowledge, seeds and produce. Because the UK is a small country and space is at a premium, many people don't have enough space to grow vegetables at home and that's why allotments are so popular. They were originally founded to help poorer working people grow their own food, but these days they are thriving communities in themselves with people from a whole range of backgrounds. I'm very lucky to have a good sized garden at home but it is quite a solitary occupation ... which is one reason I started a blog! It's the modern equivalent of chatting over the fence. Rebsie, I'd love to see a blog entry from you on the differences from your perspective! And don't be self-conscious about the differences, I love them! I'd love to find out how you pronounce "potager", "courgette" and 'secateur" if you could phonetically spell them on your blog sometime. The first time I complimented my English father-in-law on his nice back yard he was offended. Once we ironed out the terminology I learned that he thinks of a yard as a paved space, like a place you'd store machinery. What I was admiring was clearly a back garden. He did ask me why, in an American gardening book he had read, there was a chapter devoted to shade trees. He couldn't comprehend anyone planting a tree for shade. Every drop of sunlight is precious in Britain. But then I had to ask him what it was like when the ground froze. Ours doesn't freeze in Austin. Ever. And he showed me my first slug, too. When you walk on his lawn it's wet like a sponge. When you walk on mine, it crunches because it's so hot and dry. It's fun exploring our differences. I wonder how well English Roses would grow for you? They are meant to have fantastic resistance to disease. I have a few in my own garden, and are doing quite well. I am also crazy about an alba rose I have called "Celestial" which fares very well here, extremely healthy, but unfortunately, only blooms in early summer. Have you checked David Austin's Roses website? A feast for your eyes! The word yard is interesting because it has a quite different meaning in Britain - it gives the idea of a small enclosed space behind a building, either of concrete or just bare earth. Yeras ago when I first heard Americans saying their house had a yard, I felt really sorry for them and couldn't undrerstand why they didn't plant some flowers. I was also interested in potager because I've never heard it used. I would use vegetable garden or kitchen garden. Can I add another word to the list? Your eggplant is our aubergine. Love this post. I never realised that Americans used yard for all their gardens. I thought they had gardens and yards, with a yard being a large space where the kids practice their sports and the men host bbq's. I'm in England with a garden comprising of a patio, lawn area for the toddlers to play and veggie plot. Do you have patio's in America?